How Far is Nova Meridian? Nova Meridian, a residential project located in Chennai, developed by Nova Life space Private Limited. This project offers carefully crafted 1BHK,2BHK, and 3BHK apartments for sale at Mogappair West locality, the size of 1BHK apartments is 598 Sq ft, 599 Sq ft. The size of 2BHK apartments varies from 598 Sq ft to 1489 Sq ft. The size of 3BHK apartments is 1359 Sq ft, 1645 Sq ft. This thoughtfully designed project has all the modern-day facilities and functionalities so the occupants can lead a hassle-free life. The spacious rooms, elegant kitchen, living room, and the balconies are there at Nova Meridian which allows the home buyers to lead a hassle-free life. Come and be a part of this thoughtfully designed project at Mogappair West and find happiness for your dear ones. Nova Meridian is located at Mogappair West, being residents of this project, you will stay close to shopping areas, restaurants, educational instructions, health care units and to other daily utilities. Mogappair is one of the rapidly developing localities of the city, located at the west of the Jawaharlal Nehru Road (Inner Ring road) is part of the Chennai Corporation Ambattur zone. residential townships, Industrial estates, and IT parks flourish in-and-around the neighborhood of Mogappair West. Along with all these advantages and apartments at Mogappair West this project offers carefully crafted amenities too, some of them are Yoga/Meditation Hall, Indoor Games, CCTV, Intercom, Parking, Multi-purpose Hall and Gym. Thoughtfully Designed Apartments at Mogappair West Locality. Nova Life Space Pvt. Ltd. has launched "Nova Meridian Easy Homes", an easy and convenient way to own a home in the heart of Chennai without the burden of hefty down payment. All you need to book your premium home is just Rs. 4.5 lakhs. That's the lowest down payment for any city property in Chennai so far. Besides, you don’t have to pay EMI till possession. Home buying can never be so easier. NOVA MERIDIAN is a stunning 4 storey residential tower, situated in Mogappair West. Loaded with premium amenities, Nova Meridian is available on No pre-EMI offer. 1) LESS FINANCIAL BURDEN - You can now have better financial planning when opting for the NO PRE-EMI plan. While paying rent for your existing house, you don’t have to pay any EMIs till you get possession. This will efficiently reduce the financial burden. 2) WORRY-FREE ON PROJECT DELAY - Builder will be paying the EMIs on your behalf till they hand-over the project. This will ensure the project is completed on time. Now, buyers need not worry about the delay in project, as the onus is on builder to complete it on time. 3) HIGH VALUE OF APPRECIATION - Project can take approx. 2-3 years to get completed. By the time there will be a definite increase in the project value. In case buyer choose to sell the property after project completion, they will get a higher value considering they only made a down payment based on a lower price rate. Nova Meridian Easy Homes offer of lowest down payment along with No Pre-EMI, turns out to be the easiest way to buy a home in Chennai. Amenity spaces and apartments at Nova Meridian, have been created to effortlessly combine contemporary style, slick materials and bespoke finishes. Special attention has been given to the quality of lighting, fixtures and fittings. Individual items have been chosen for both their aesthetics and durability and careful thought has been given to creating an overall finish that demonstrates harmony, balance and proportion in an eco-friendly and sustainable fashion. Main Door : Double shutter doors with Architrave Frame – 1st Outdoor with Wood Frame and MSGrill and 2nd Door with Engineered Wood. Biometric Lock, Brass tower bolt at top and bottom, Magic eye, safetychain brass door stopper. Utility Provision: SS sink with Bowl and drain board Washing machine point. Corridor: 2' x 2' Vitrified tile flooring and Wall cladding up to false ceiling. Water Sump : 70,000 Lts Capacity. Sewerage tank : 1,35,000 Lts capacity – 1 No. 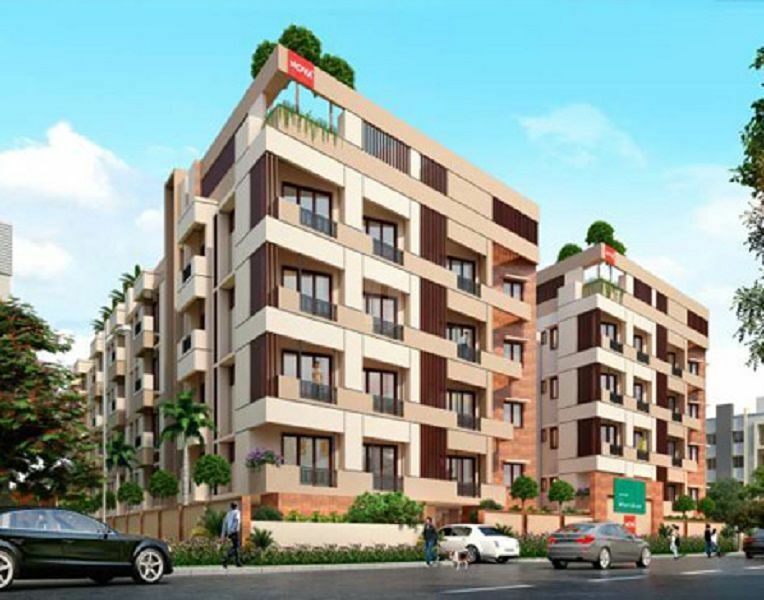 Flats : 3 BHK & 2.5 BHK (Study) - 1000 watts, 2 BHK – 800 watts, 1 BHK – 500 Watts. Video Door phone – 1 No. , Wall light – 1 No. Wall light point – 1 No. 6A socket – 1 No. 16 A Fridge Point - 1 No. Exhaust fan point – 1 No. 16A socket (Geyser) – 1 No. Mirror light point – 1 No.